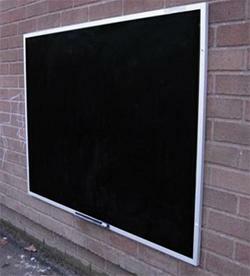 Available at Notice Board Company is the External Chalk Notice Board perfect for schools and parks. This board comes with a satin silver flat frame and mitred corners. The board is 100% weatherproof and has a 13mm deep unbreakable chalk surface made from a high pressure laminate. The External Chalk Board is perfect for outdoor use, specifically parks and primary school playgrounds. This product is available in standard sizes ranging from 600 x 900mm to 2400 x 1200mm, however bespoke sizes are available upon request. A 5 year guarantee comes with this board. The current lead time for this notice board is 10-15 working days. Please email or phone for more information.